One such place in Gdansk is undoubtedly the popular St. Mary’s Church. But I do not want to write about it again. What I want to do now, is write about an incident that took place in an overseas country. The incident had an impact on the creation of an interesting epitaph (and a chapel too) in the said church. Since he remembered, Johan Nilsson Gyllenstierna (av Ludholmen) had nearly always been in love with Sigrid Brahe (seems with reciprocity). But… (there always is a BUT in every story)… Sigrid was “promised” to Erik Bielke. And it is very much possible, that everything would have happened according to the family scenario, if not for… Princess Anne Vasa. Sigrid was one of the ladies-in-waiting at Anne’s court and at the same time she was one of her favorite ones too. Johann Nilsson on the other hand – was one of the Swedish nobles, who opted for Sigismund III Vasa. Apart from her beloved Princess, Sigrid, had no one to confide her illicit love to a beautiful cavalier (for this was how the contemporary described Johan Nilsson). Anna remembered her own romantic episode (almost since her childhood she was in love with Gustav Brahe), so who better than she could understand the despair of the girl. And there was something more… There were rumors about Erik Bielke’s shameful disease. It was believed that he had caught the disease during his trip to Poland. That was more than enough for the girl. She simply fled to Stegeborg, her Lady’s castle. Soon, Johann came to the castle too… Anne, moved with compassion, trusting in the strength of her authority (after all, she was the king’s sister), arranged a hasty wedding of the couple. 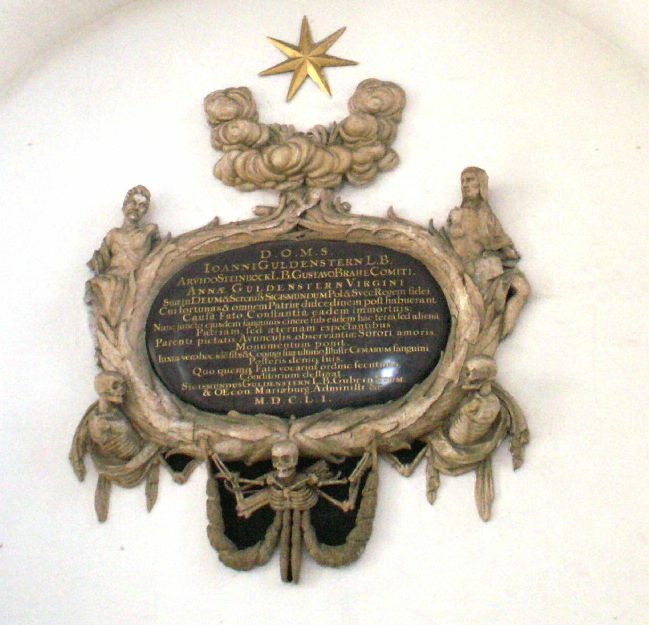 It was Wednesday, 19th March 1595, and the witnesses were Princess Anne and Lindorm Bonde – the envoy to Sigismund III. Instantly there rose an uproar in the kingdom. In the premises of the three mighty families: Gyllenstierna, Brahe and Bielke there were even rumors about war among the families. However, nothing could be done, because the marriage had been legally concluded. And that, in the presence of the royal sister and royal envoy. And here – a little digression – what luck, that Sweden was not familiar with the Polish squabbling and lawlessness from a bit earlier times. Because otherwise Sigrid would have inevitably ended as Halszka Ostrogska did. The Parliament resolved that national problem in such a way that the Gyllenstierna family was ordered to pay compensation to the Bielke family, and also a so called supplementary for the poor. In total, about 3 thousand thalers. Also it was enacted that the young couple should remain away from the so-called great world for at least 6 months in the year, so as not to annoy the humiliated family of the former fiancé. During their stay in Kalmar – their son was born, whom they named Sigismund in honor of the Polish king. Soon, the supporters of King Sigismund III had to leave Sweden because Charles – who yet was only a regent – he made a formal coup and seized power in the country. It was easier for him, as in contrast to the ultra catholic Sigismund – he was a Protestant. Sweden at that time was also Protestant, and the conduct of Sigismund was far from the tolerance of his Polish ancestry on the distaff side. Johan Nilsson Gyllenstierna settled with his family in Gdansk. In 1608 he became a widower, and died in 1617. The chapel is located in the St. Mary’s Church – on the north side of the entrance, near the Shoemakers’ Gate. It is called the chapel of St. Reinhold or very often the Guldenstern Chapel. Above the entrance to it there can be seen a very interesting family epitaph. The founder, as I said was Zygmunt – or rather, Sigismund Gyllenstierna. Gdansk citizens as well as the Polish courtiers, with whom Johan had contacts had the same problems with the correct pronunciation. Therefore the surname had to be changed… His son was already known as Guldenstern. And as such, is known as the founder of the chapel. Very important is the message of the founder, that not only members of the family can find the rest in the chapel. It was said that also those who had lost their Swedish homeland… But it is a topic for a separate story. And what about Sigismund? He received excellent education in Torun’s Academic Gymnasium (which was one of the three such schools in the Polish Kingdom with an extremely high level of teaching). In 1633 his nobility was approved by the coronation Diet of Wladyslaw IV. In 1635, at the king’s command he and Gerhard Denhoff became directors of the Commission of His Royal Highenss’ Fleet. His wife was Anna von Zehmen (Czema), daughter of Chelmno Castellan – Fabian Czema. And nine years later at the Torun Town Hall, during the Colloquium Charitativum he chaired the Lutherans of the Polish Kingdom.